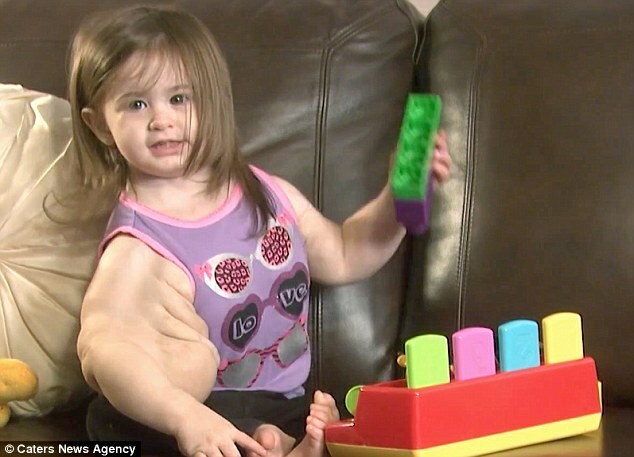 An adorable tot has been dubbed the 'Baby Hulk' due to a watermelon-sized tumour that makes her look like a bodybuilder. Madison Gatlin, from Crestview in Florida, was born with CLOVES, a condition that causes lymphatic fluid to swell beneath her arms and chest. The ultra-rare illness, caused by a gene mutation, affects only 200 people worldwide. Doctors first spotted unusual fluid during an ultrasound at 15-weeks and believe the little girl is lucky to be alive. 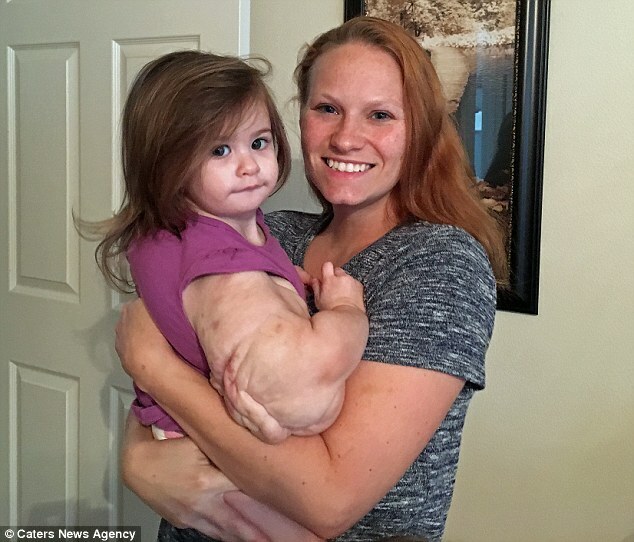 Since her birth, the swelling around her upper torso and arms have continued to grow and is estimated to weigh 5lbs - the same weight as a bag of sugar. 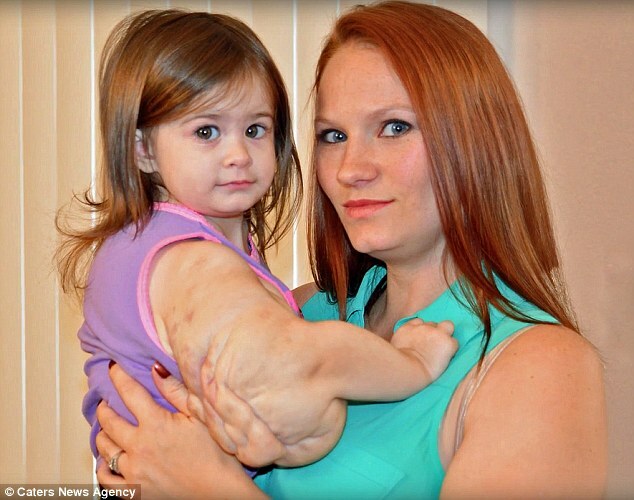 Her parents have nicknamed her 'Baby Hulk' for her muscular appearance. Eighteen-month-old Madison is considered a medical miracle after defying death and learning to walk despite doctors prediction she wouldn't be able to. Joni, a full-time mum-of-two, said: 'The upper half of her body looks like she's gained weight and it makes her look like a bodybuilder, she's like a 'baby Hulk'. 'Her nickname started during an instance where twin boys asked me what was wrong with her, I told them her daddy was the Hulk and they thought it was the coolest thing ever. 'After I told them she was the Hulk's daughter they wanted to be her best friend.I don't want people to be scared of my daughter, there's nothing wrong with her, she just has a gene malfunction. She continued: 'I've told younger children she's a baby Hulk because I don't think they would understand the condition and this way they aren't scared of her and don't treat her differently. After months of testing Madison was diagnosed with the rare progressive overgrowth disorder. Joni added: 'When she was born Madison looked drastically different to what I expected, from her high waist up to her shoulders she looked very muscular. 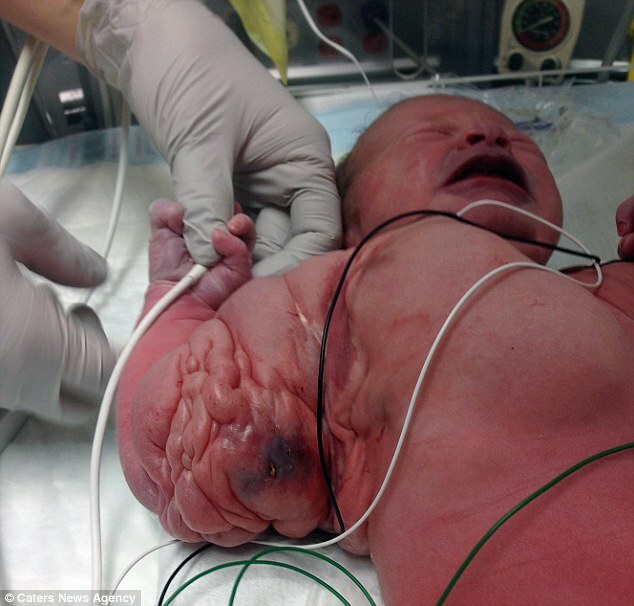 'The majority of her upper body and arms are filled with lymphatic fluid that her body is unable to drain back into her bloodstream - leading to cystic masses developing in those areas. 'Particularly in her right arm, the mass is currently the size of a small watermelon, it will continue to grow with her body based upon her height and weight. To prevent the growth from expanding, specialists have to perform chemical cauterisation - where a small amount of fluid is withdrawn from her body and reinjected with a mix of medication and saline. She also has to wear compression garments 24-hours a day and has the fluid drained twice a day. CLOVES is an acronym standing for Congential, Lipomatous Overgrowth, Vascular Malformations, Epidermal Nevi & Spinal/Skeletal/Seizures. Kristen Davis, Executive Director of CLOVES Syndrome Community, said: 'CLOVES is caused by non-hereditary somatic mutation - the affected gene that causes CLOVES is called PIK3ca, a mutation that is often implicated in aggressive cancers. 'Overgrowth related to CLOVES can occur anywhere in the body including brain, trunk, limbs including hands/feet, as well as internal soft tissue tumors and vascular malformations.